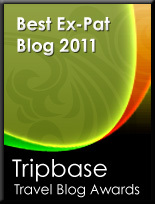 A very warm welcome to the ExpatCapeTown Newsletter edition for April/May 2012. Dear all, this newsletter is really long overdue. For all who have been waiting for this edition, many thanks for your many kind queries, friendly support and patience. As I am currently restructuring my website and am busy researching, writing and restructuring the site, time just did fly to fast to catch up with all I would have liked to do. Don't you love Cape Town in autumn? The sun is still high and warm, however, the evenings get cooler again, so we have clear starry nights with a bit of a breeze. That is just so nice to relax and have a good night's rest. The gardens look so lovely now with all the lush greens due to the rain and the golden foliage on the trees is quite a sight! I am sure the last weeks just whooshed past most of you too and the next days will bring us a much deserved short holiday. For those staying here during the next weeks, life will be fun with lots of exciting events taking place in and around Cape Town during the next weeks. So enjoy this newsletter and have a great time in Cape Town or wherever you are! According to the EatOut Awards, five Cape Town restaurants belong to the ten top restaurants in in the country. Furthermore four other fabulous restaurants in the top ten are situated in the stunning Cape Winelands and so in close reach. What an amazing achievement for the great chefs and their teams! Remember when planning a special evening at any one of these top restaurants, book as early as possible to avoid disappointment. Tables are booked out often weeks in advance. But you always can try as somebody might have cancelled short-notice. And as Cape Town is often called a Foodie Capital, you might as well go out and start you own little list with your favourite restaurants in the Mother City. There are so many gems to discover or follow the tips of fellow expats like those in the friendly expat cape town forum on facebook. There is always some get together planned. There are so many other formidable scenic restaurants close to the sea, little cozy bistros, comfy café shops, trendy bars and elegant restaurants for dining in style, you definitely will agree that eating out in one of the best past times to have when living in Cape Town. And enjoy autumn in beautiful Cape Town! The seasons are changing and the wine harvest 2012 was a successful one if one believes some of the Cape’s prominent winemakers. Now you have to get the food to match with your wine! Cheese Lovers will certainly be in for a treat at the annual Cheese Festival at Sandringham which runs this long weekend from April 27 to April 30, 2012. Sandringham is close to Paarl, off exit 39 on the N1. Remember to book your entrance tickets ( R110) upfront via computicket as there are no tickets available at the gate. More info on the Cheese Festival here. In this section you will find every month insiders’ tips and advice about one of the many suburbs of Cape Town. So you know where to stay and where to go. This month I chose to bring you some more info about living in Plattekloof. Why the Plattekloof? Contradictory to its name the suburb is not flat, but lies on the Tygerberg, which is the prominent hill in Cape Town's northern suburbs. The name obviously was mistakenly given to the area as Panorama, the suburb lying to the foot of Tygerberg is the flatter area. The views from Plattekloof towards Cape Town are stunning as you can see in my picture. Plattekloof is located a mere 20 minutes drive north east of Cape Town CBD and is easily reached by car via the N1 highway. But beware the traffic into town during rush hour is better to be avoided. In Plattekloof, you will find plenty of excellent amenities, the Mediclinic Panorama is in close vicinity and plenty of shopping facilities are in the area, from tiny boutiques to family shopping centers. Where to stay? 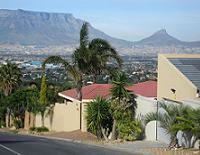 This is mainly a housing area with free standing houses on the slopes of the slopes of Tygerberg. The area is very popular with families as there are good public schools in the area. Where to go? There are some family restaurants and some little coffeeshops in the area. If you want to go out, the Durbanville area further to the north offers a wide range of entertainment options and driving into the city is a breeze in the evenings too. If you like walking, the Tygerberg nature reserve offers some nice walks with amazing views across the city and the bird life in this green lung at the edge of the city is truly magnificent. What is an "appletizer"? This South African fizzy apple cool drink was created already in 1966 and is now so popular that Coca Cola owns half of the shares of this South African product. What is "pratley putty"? If you look for some sticky putty to hold things together, you will come across this South African product which is used almost everywhere to mend broken pieces. Actually this putty is so strong that it has been send up to the moon on the Apollo XI mission to hold some broken parts together on the Eagle landing craft. Where to find mosaic art? At the Vrede en Lust Mosaic Studio in Durbanville you can see some stunning pictures made of various types of mosaic stones. There you can also enroll for mosaic art classes. The historic mansion which a long time ago served as a prison, has a lovely little coffeeshop with yummy treats. Where to go for a great day out in the Winelands? Enjoy a delicious lunch with gorgeous views over the landscaped gardens at Rhebokskloof Wine Estate near Paarl. The kids can run about and there is even a small playground with climbing frame near the terrace so you can watch your little ones from your seat and make sure they do not wander off as there is a pond in the gardens too. The food is lovingly prepared and tastes divine. Where to have a delicious introduction into African food? Book a table at Africa cafe to taste some of their delicious African treats. The variety of African dishes and tapas were well presented and really tasty. The food came in their colorful Africa cafe range ceramic dishes and the friendly waitresses were always keen to advise and served the ordered food quickly. If you prefer to go there for dinner, they offer a wider range of African foods and some entertainment in the evenings. Highly recommended! Remember, if you need some advice urgently, it is always a good idea to get in touch with the many friendly expats in our Expat Cape Town forum on Facebook. Make sure you join and feel free to ask your questions regarding moving to or living in the Mother City. There is always someone there to share insights and experiences and get you the info you need.